Say thank you with this beautiful Lavender Dreams gift box! 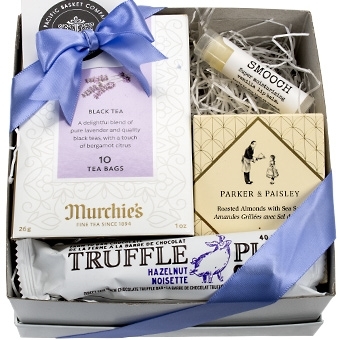 Our mini gift box contains lavender tea by Murchies. a box of almonds by Parker and Paisley, a hazelnut Truffle Pig bar by Hagensborg and Smooch lip balm by K'Pure. Box size 6x6x3"